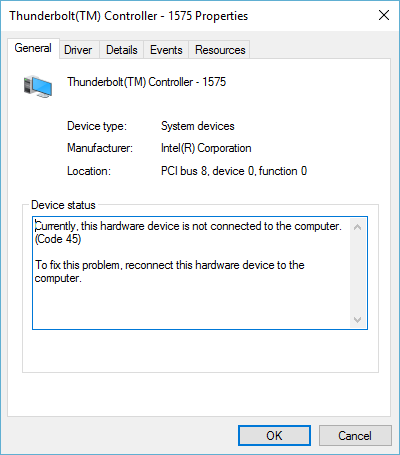 Second, in device manager, there is no listing (visible or invisible) for ASMedia USB 3.0 Extended Host Controller Driver for Dell Thunderbolt Dock, regardless of uninstalling it through Add/Remove Programs and re-installing. One more note - I am able to work normally after booting with the lid open successfully and then closing the lid. I have the exact same symptoms with the same hardware (precision 5510 & WD15). the computer will not POST when it is either started or restarted with the built-in display closed. If the lid is open... all is fine. Ohh.. and when you do try to start/restart with the lid closed, i get a 2 orange, 7 white blink code. it will continue to repeat this until I open the lid and press the power button. This will then cause the unit to successfully POST and boot up. I am seeing same issue with Precision 5510 and Thunderbolt dock exactly as described. Windows 10 x64 with latest BIOS, firmware applied to dock, and BIOS settings configured for Thunderbolt dock. When plugged into dock and booting up from scratch or from hibernated state it hangs with blinking lights....2 orange and 7 white blinking codes. Does not matter if laptop lid is closed or open. I can disconnect dock and boot up fine, then connect dock once OS is loaded. Id like to add my name to this list. A couple other problems I have that no one has mentioned yet. Im using (2) U2410 Dell Monitors. Im not sure if its because the 5510 is a 4k screen and these are not but once I power up the Dell and get it on both monitors, I then need to right-click on the desktop, bring up 'display settings' and click on the link under the monitor layout, advising me to sign out. (???) I have to do this every time I power on, otherwise I will see weird things like my mouse pointer being Gigantic, or my tool bar icons being tiny, or when hovering over icons on the toolbar and not being able to read the informative text (such as battery life). Once I sign out and sign back in thru the display settings, most things will be fixed. I still see issues when i open programs and the toolbar text sizes within the apps, being giant or microscopic. Lastly, it appears the thunderbolt has a serious overheating issue. I dont run any labor intensive programs and am aware of 'flashy' websites that could tax the CPU. This is not the case. After about 4 hours of running my setup, usually after 4 hours (when i go to lunch) when I get back after 30-40 minutes of idling, I notice my mouse (which runs thru bluetooth) is no longer responsive. I have to plug in an old cabled mouse, turn off bluetooth, then re pair my mouse with the dell. This bluetooth disconnect was never an issue before I started using the docking station. I hope these issues get fixed soon because Im constantly restarting my system to get it to work. I was having all the same issues. I have spoken with Dell and they are still working on a resolution for the docking station issues. After updating all the firmware and drivers I was able to boot my laptop while the lid was closed and hooked to the dock. I am still having issues with my USB ports not working on the dock and the Bluetooth devices not responding after a couple of hours of being docked. Has anyone been able to resolve these issues? I have 4 Precision 5510s which work great until you consider the docking station. The problem that all 4 have is that the USB ports turn off when there is no activity. An external disk drive works fine since windows keeps it busy. On the other hand a wireless keyboard and mouse that is not used for a few minutes disconnect because the USB port shuts down. They I have to remove the USB wireless connector and plug it in to the laptop. I found a work around/solution. 1) Go to the device manager and human interface while keeping the mouse busy. 2) Find the device and it's properties. 3) Remove the "Allow the computer to turn off this device to save power" option. In my case there is a device for both the mouse and keyboard. After doing this it works fine. I am having the same issue. I have a precision 5510 with a WD15 thunderbolt dock that continues to lose USB connections and Ethernet. After unplugging and plugging back in about 6 times it finally stays working. I see now that this is a common issue and wish Dell would get this resolved.